“I studied this in graduate school where, under a NASA study, I was charged with how we could get to Mars quickly,” says McGuire, who earned his Ph.D. at the Massachusetts Institute of Technology. Scanning the literature for fusion-based space propulsion concepts proved disappointing. “That started me on the road and [in the early 2000s], I started looking at all the ideas that had been published. I basically took those ideas and melded them into something new by taking the problems in one and trying to replace them with the benefits of others. So we have evolved it here at Lockheed into something totally new, and that’s what we are testing,” he adds. 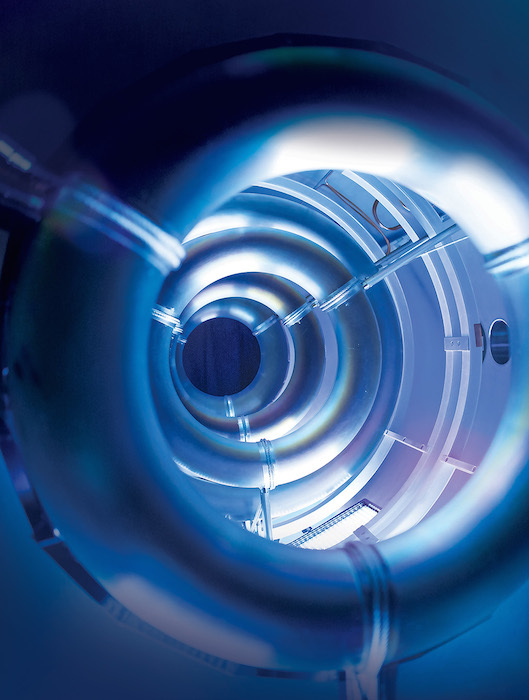 To understand the breakthroughs of the Lockheed concept, it is useful to know how fusion works and how methods for controlling the reaction have a fundamental impact on both the amount of energy produced and the scale of the reactor. Fusion fuel, made up of hydrogen isotopes deuterium and tritium, starts as a gas injected into an evacuated containment vessel. Energy is added, usually by radio-frequency heating, and the gas breaks into ions and electrons, forming plasma. Overall, McGuire says the Lockheed design “takes the good parts of a lot of designs.” It includes the high-beta configuration, the use of magnetic field lines arranged into linear ring “cusps” to confine the plasma and “the engineering simplicity of an axisymmetric mirror,” he says. 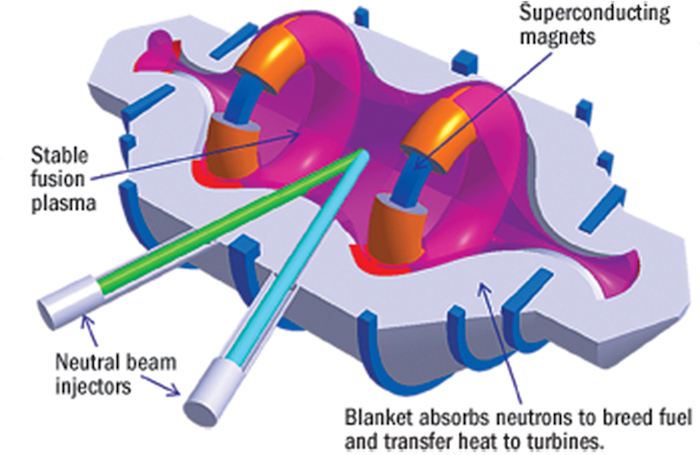 The “axisymmetric mirror” is created by positioning zones of high magnetic field near each end of the vessel so that they reflect a significant fraction of plasma particles escaping along the axis of the CFR. “We also have a recirculation that is very similar to a Polywell concept,” he adds, referring to another promising avenue of fusion power research. 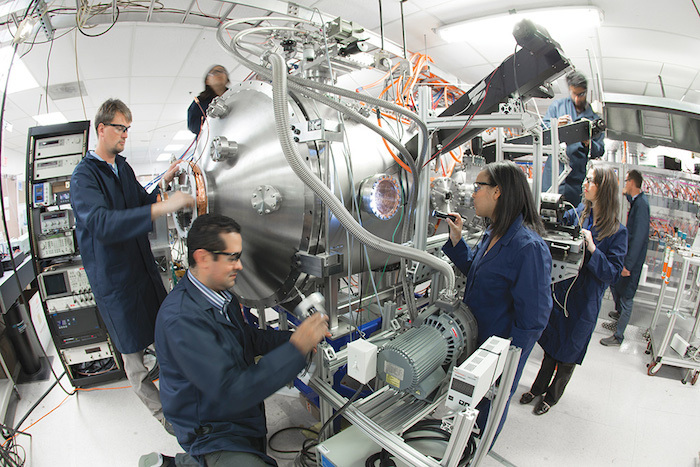 A Polywell fusion reactor uses electromagnets to generate a magnetic field that traps electrons, creating a negative voltage, which then attracts positive ions. The resulting acceleration of the ions toward the negative center results in a collision and fusion. An initial production version could follow five years after that. “That will be a much bigger effort,” he says, suggesting that transition to full-scale manufacturing will necessarily involve materials and heat-transfer specialists as well as gas-turbine makers. The early reactors will be designed to generate around 100 MW and fit into transportable units measuring 23 X 43 ft. “That’s the size we are thinking of now. You could put it on a semi-trailer, similar to a small gas turbine, put it on a pad, hook it up and can be running in a few weeks,” McGuire says. The concept makes use of the existing power infrastructures to enable the CFR to be easily adapted into the current grid. The 100-MW unit would provide sufficient power for up to 80,000 homes in a power-hungry U.S. city and is also “enough to run a ship,” he notes. Operational benefits include no risks of suffering a meltdown. “There is a very minimal amount of radioactive tritium—it’s on the order of grams—so the potential release is very minimal. In addition, there is not enough to be a risk of proliferation. Tritium is used in nuclear weapons but in a much larger inventory than would be involved here, and that’s because you are continually making just enough to feed back in [to maintain the reaction],” he adds.